From 20 October 207, Fondazione Prada will present at its Milan venue a research and information program on the Chicago art scene developed in the aftermath of World War II. The Fondazione thus further expands its strategy of reinterpretation of those moments in contemporary art history that, although not entirely acknowledged by critics, have nonetheless influenced new generations of artists, from graffiti to neo-digital artists. The project is focused on the employment of a painting style characterized by political commitment, figurative narratives and radical graphics, and therefore rejected by mainstream New York culture – which was more interested in the abstract and impersonal dimensions of art. 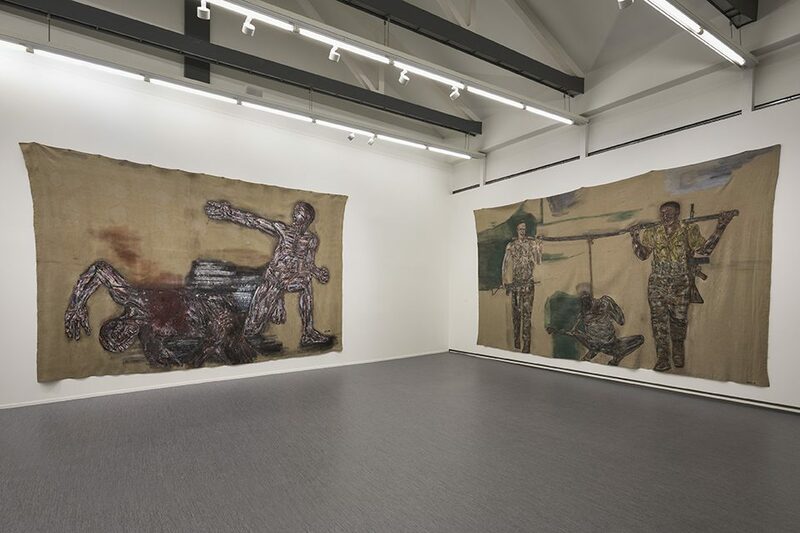 The exhibition is structured around three thematic sections conceived and curated by Germano Celant as a whole – “Leon Golub”, “H. C. Westermann” and “Famous Artists from Chicago. 1965-1975” – all devoted to two generations of artists formed in Chicago between the 50’s and the 60’s. This project further investigates the artistic production of those two decades in a location far from the main artistic centers, from Paris to New York, and explores the development of alternative scenes generated in art schools and academies, namely the School of Art Institute of Chicago, which critically competed or opposed Minimal Art’s industrial and essential approach. 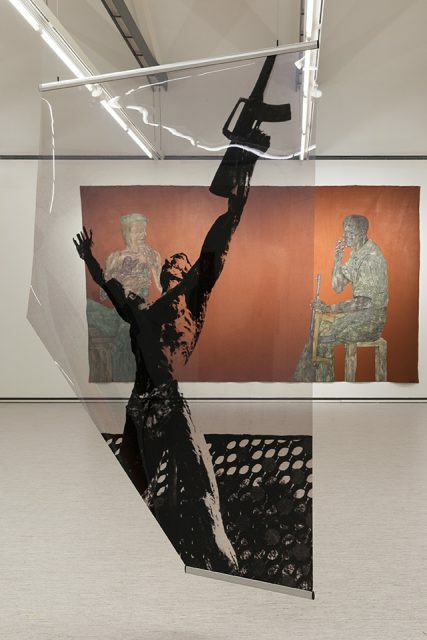 “Leon Golub”, the first part of the project, is hosted in the Fondazione’s Nord and Sud galleries, and explores two complementary aspects of the artist’s production, displaying 27 acrylic paintings on canvas of spectacular dimensions, realized between the late 70’s and the early 80’s, and more than 50 photographs painted on transparent paper in the 90’s. Golub (Chicago, 1922 – New York, 2004), since his formative years in Chicago, developed a personal approach to figurative painting, detaching himself from the dominant styles of New York School’s Action Painting and Abstract Expressionism. The exhibition focuses on the political aspects of his work, which openly denounces the brutality of war, racism, torture and violence. Throughout his life, his subjects became more extreme, such as his direct references to the Vietnam war, which, once depicted on large canvases – in the Mercenaries series, for instance – become symbols of the paramilitary conditions of contemporary life. 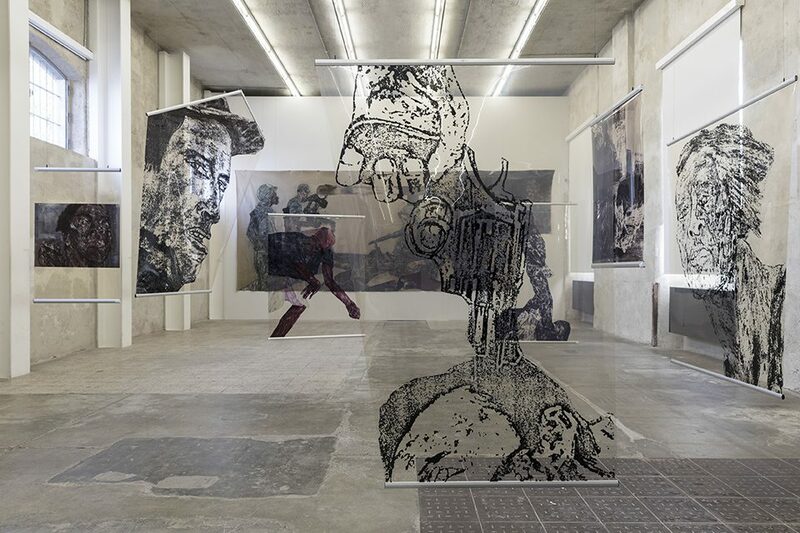 In his photographic transparencies, Golub manipulates and alters existing images of the same dramatic and tragic subjects which, after being photocopied and photographed, are transferred by the artist onto transparent sheets that emphasize the rough realism of his work. This exhibition includes representations of violent situations that may disturb or offend some visitors. Minors are strongly advised to avoid visiting the exhibition, and in any case may do so only when accompanied by an adult who assumes full responsibility for the visit. For additional information about the content of this exhibition, please speak with a staff member. Anyone who is interested in finding out more before visiting can stop by the ticket office for a document that provides a complete overview of the images contained in the exhibition and insights into the issues these artworks address.